Mikhail is known for his creative approach to transmitting knowledge in a dynamic and challenging fashion. His mission is to equip participants with the necessary tools and techniques to maximize their performance and enhance their confidence. Mikhail brings over 15 years of business experience in the Engineering, Construction and Consulting industries including experience leading and managing others. Mikhail has carried out training sessions to hundreds of participants in professional academic settings. 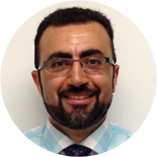 Mikhail holds a doctorate degree in Project Management from the University of Calgary. He also holds a Project Management Professional (PMP) and Risk Management Professional (PMI-RMP) designations from the Project Management Institute (PMI).